Discovery plot of PSR J0250+5854, folded at the fundamental period of 23.535 s, as inferred by the harmonically related candidates from the same observation. Note that, in the discovery observation, there was no candidate identified at the fundamental period itself. Credit: Tan et al., 2018. An international team of astronomers has discovered a new radio pulsar as part of the LOFAR Tied-Array All-Sky Survey (LOTAAS). 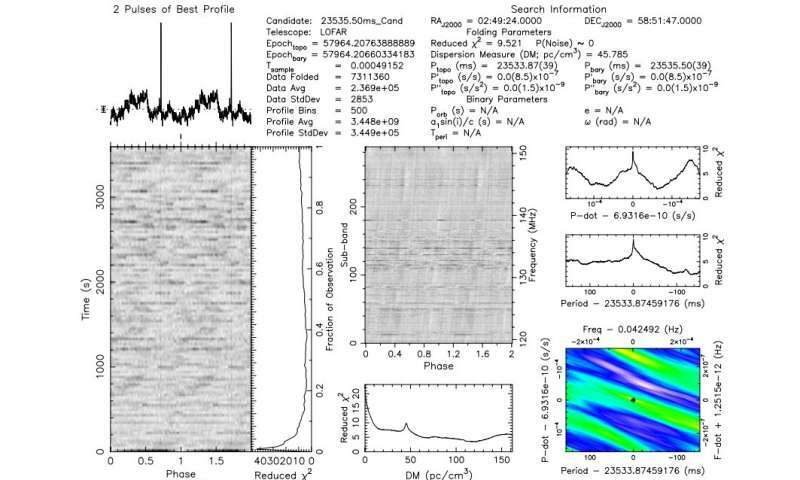 The newly detected object, designated PSR J0250+5854, turns out to be the slowest-spinning radio pulsar known to date. The finding is reported in a paper published September 4 on arXiv.org. Extraterrestrial sources of radiation with a regular periodicity, known as pulsars, are usually detected in the form of short bursts of radio emission. Radio pulsars are generally described as highly-magnetised, rapidly rotating neutron stars with a lighthouse beam of radiation that produces the pulsed emission. However, finding new, long-period radio pulsars with a spin period of over 5.0 seconds is challenging for astronomers. Notably, only five of the 10 longest-period pulsars known have been found in periodicity searches, mainly due to their consistently larger aggregated flux over time. Recently, a group of researchers led by Chia Min Tan of the Jodrell Bank Centre for Astrophysics in Manchester, UK, has found a new radio pulsar with a relative long spin period. The detection was made in July 2017, using the LOw Frequency ARray (LOFAR) radio telescope network located mainly in the Netherlands, as part of the LOTAAS survey. LOTAAS is an all-Northern-sky survey for pulsars and fast transients at a central observing frequency of 135 MHz. Follow-up observations of the newly found pulsar were conducted using various ground-based observatories, including Green Bank Telescope, Lovell Telescope and Nancay Telescope. "We subsequently detected pulsations from the pulsar in the interferometric images of the LOFAR Two-meter Sky Survey, allowing for sub-arcsecond localization," the astronomers wrote in the paper. Located some 5,200 light years away from the Earth, PSR J0250+5854 is a rotation-powered pulsar, what means the loss of rotational energy of the star provides the power for the radio emission. It has a spin period of approximately 23.5 seconds, which makes it the slowest-spinning radio pulsar known. Moreover, PSR J0250+5854 also has the slowest spin period when compared to any other known magnetars and X-ray dim isolated neutron stars (XDINSs). The authors of the paper noted that the similarity of the rotational parameters of the newly detected pulsar to the XDINSs and magnetars indicates a possible connection between them. The researchers also found that PSR J0250+5854 has surface magnetic field strength of 26 trillion G, age of 13.7 million years and spin-down luminosity of 82 octillion erg/s. According to the paper, these values suggest a dipolar magnetic field configuration in this pulsar. In concluding remarks, the scientists emphasized the importance of their discovery, noting that it has significantly expanded the known range of rotation-powered pulsar periods. They added that LOTAAS has the potential in discovering more slow-spinning pulsars similar to PSR J0250+5854 or even with slower spin periods. I wish I knew what you guys were talking about. Pulse scan be synchronous events, or WTF? Does anybody see the many ways to make a very large oscillator that makes sense!